The United Kingdom of Great Britain and Northern Ireland – commonly known as the United Kingdom, the U.K., or incorrectly as Britain – is a sovereign state located off the northwestern coast of continental Europe. It’s an island country, spanning an archipelago including Great Britain, the northeastern part of Ireland, and many small islands. Northern Ireland is the only part of the U.K. with a land border, sharing it with the Republic of Ireland. Apart from this land border, the U.K. is surrounded by the Atlantic Ocean, the North Sea, the English Channel and the Irish Sea. The largest island, Great Britain, is linked to France by the Channel Tunnel (or “Chunnel”). The United Kingdom is a constitutional monarchy and unitary state consisting of four countries: England, Northern Ireland, Scotland and Wales. It’s governed by a parliamentary system with its seat of government in London, its capital, but with three devolved national administrations in Belfast, Cardiff and Edinburgh, the capitals of Northern Ireland, Wales, and Scotland, respectively. The Channel Island bailiwicks of Jersey and Guernsey, and the Isle of Man are Crown Dependencies are often not considered part of the U.K., though they are treated as part of it for many purposes including nationality. The U.K. has fourteen overseas territories, all remnants of the British Empire – which, at its height in 1922, encompassed almost a quarter of the world's land surface, the largest empire in history. British influence continues to be observed in the language, culture, and legal systems of many of its former colonies, which includes Canada. The U.K. is a developed country, with the world's sixth largest economy by nominal GDP and the seventh largest by purchasing power parity. It was the world's first industrialised country and the world's foremost power during the 19th and early-20th centuries. However the economic cost of two world wars, and the decline of its empire in the latter half of the 20th century, diminished its leading role in global affairs. The U.K. nevertheless remains a major power with strong economic, cultural, military, scientific, and political influence. It’s a nuclear power and has the fourth highest defence spending in the world. It’s a Member State of the European Union (EU), holds a permanent seat on the United Nations Security Council, and is a member of the Commonwealth of Nations, G-8, the Organisation for Economic Co-operation (OECD), the North Atlantic Treaty Organisation (NATO), and the World Trade Organisation (WTO). Although shopping throughout the UK can be expensive, it is generally regarded as a world-class destination for shoppers (both in terms of variety and quality of products), depending on where you shop and what you buy. Fierce competition has brought prices down considerably in the food, clothing and electronics. Avoid buying from the tourist areas and stick to the High Street-type shops, or visit the many “out-of-town” retail parks, where prices will be considerably cheaper. The U.K. has a benign humid-temperate climate moderated by the North Atlantic current and the country's proximity to the sea. Warm, damp summers and mild winters provide temperatures pleasant enough to engage in outdoor activities all year round. Having said that, the weather in the U.K. can be changeable and conditions are often windy and wet. British rain is world renowned, but in practice it rarely rains more than two or three hours at a time and often parts of the country stay dry for many weeks at a time, especially in the East. More common are overcast or partly cloudy skies. It is an idea to be prepared for a change of weather when going out; a jumper and a raincoat usually suffice when it is not winter. The Collegiate Church of St Peter at Westminster, which is almost always referred to popularly and informally as Westminster Abbey, is a large, mainly Gothic church, in Westminster, London, just to the west of the Palace of Westminster. It is the traditional place of coronation and burial site for English and British monarchs of the Commonwealth Realms. Her Majesty's Royal Palace and Fortress, more commonly known as the Tower of London (and historically as The Tower), is a historic fortress and scheduled monument in central London, England, on the north bank of the River Thames. It is the oldest building used by the British government. Big Ben is the nickname for the great bell of the clock at the north end of the Palace of Westminster in London, and is often extended to refer to the clock or the clock tower as well. Big Ben is the largest four-faced chiming clock and the third-tallest free-standing clock tower in the world. It celebrated its 150th anniversary in May 2009. Windsor Castle, in Windsor in the English county of Berkshire, is the largest inhabited castle in the world. Together with Buckingham Palace in London and Holyrood Palace in Edinburgh, it is one of the principal official residences of the British monarch. Queen Elizabeth II spends many weekends of the year at the castle. Stonehenge is a prehistoric monument located in the English county of Wiltshire, north of Salisbury. One of the most famous sites in the world, Stonehenge is composed of earthworks surrounding a circular setting of large standing stones. It is at the centre of the most dense complex of Neolithic and Bronze Age monuments in England, including several hundred burial mounds. The Cathedral of Saint Paul — informally known as Saint Paul's Cathedral — is the mother church of the Roman Catholic Diocese of Birmingham in Alabama. Father James Coyle's remains will be relocated from Elmwood Cemetery to this church where he was its priest. The White Cliffs of Dover are cliffs which form part of the British coastline facing the Strait of Dover and France. The cliffs are part of the North Downs formation The cliff face owes its striking façade to its composition of chalk (pure white calcium carbonate) accentuated by streaks of black flint. Hadrian's Wall is a stone and timber fortification built by the Roman Empire across the width of what is now northern England. It was the first of two fortifications built across Great Britain, the second being the Antonine Wall in what is now Scotland. Hadrian's Wall is the better known of the two because its physical remains are more evident today. 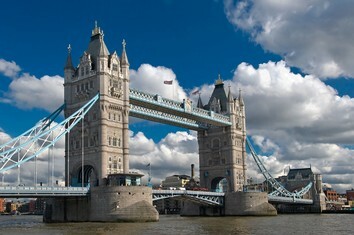 London Bridge is a bridge between the City of London and Southwark in London, U.K., over the River Thames. It forms the western end of the Pool of London. On the south side of the bridge are Southwark Cathedral and London Bridge station; on the north side are the Monument to the Great Fire of London and Monument tube station.